It was the most frustrating day so far of the Olympic sailing competition with the wind refusing to play fair on Guanabara Bay. 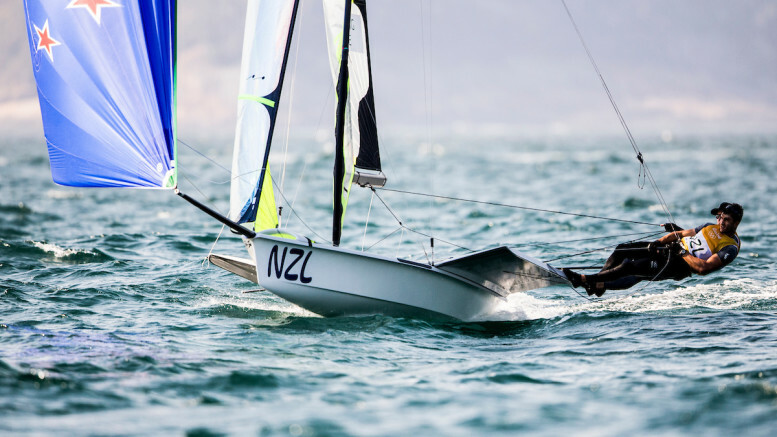 After sitting around for most of the day in next to no wind, the ten finalists for the Women’s Laser Radial Medal Race were released from the shore just before 16:00 local time. At the time, the idea of wind arriving seemed optimistic, but just ten minutes later the breeze had risen to a very pleasant 15 knots. Just five minutes after that, the wind was gusting in at over 30 knots and the waves were building up quickly. The race committee made the reluctant call to postpone the Medal Race until Tuesday (16 August). The 470 Men’s and Women’s fleets didn’t manage any racing in the Bay as they waited for wind, but when the big 16:00 buster arrived, boats were capsizing everywhere. There were sails shredded in the gusts and it will be a long evening for some crews making sure their boats are repaired and ready for the next day. Out on the ocean courses the 49er Men and 49erFX Women enjoyed some stunning conditions but for the Men’s fleet it was a race to get back to the Marina da Gloria as the worst of the late afternoon gusts struck just as the last boats were crossing the finish line. Tamara Echegoyen and Berta Betanzos (ESP) fired two bullets from today’s three races on the Niterói course moving the reigning World Champions to the top of the scoreboard. Behind them are two former World Champion crews, Alex Maloney and Molly Meech (NZL) who are four points behind the Spanish in second, and Martine Grael and Kahena Kunze (BRA) just one point behind the Kiwis in third overall.